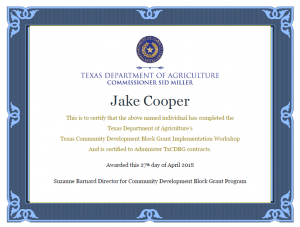 Jake Cooper, TGB’s business development manager, recently completed his certification to administer Community Development Block Grants (CDBG) in Texas. The certification was given by the Texas Department of Agriculture. TGB Group is currently working with several smaller cities across Texas that are actively looking for additional funding for their projects. Community Development Block Grants can make that happen. We can now help cities that fit certain criteria (see below) to find the funding they need for a wide range of project types. The grant amounts vary, but a city can be awarded up to $800,000 depending on the nature and specifications of its project. 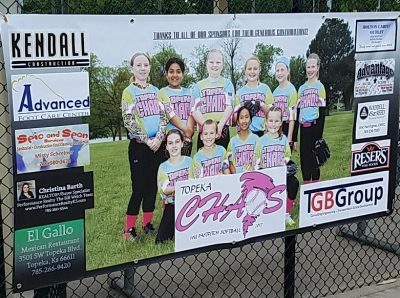 Administering Community Development Blog Grants will help TGB Group to build more solid relationships and offer critical solutions to cities, many of which may not have known that this grant was an option for them. The key objective of the Community Development Block Grant program in the state of Texas is to help communities grow and prosper by providing suitable housing and living environments while creating new economic opportunities, primarily for low- and moderate-income individuals and families. To be eligible for a Community Development Block Grant, applicants must be non-entitlement cities with a population of fewer than 50,000 people. Non-entitlement counties also may apply, providing that their non-metropolitan population is below 200,000 and that they aren’t eligible for CDBG funding through Housing and Urban Development (HUD). The TGB team looks forward to being able to make a difference in Texas communities wishing to expand and improve quality of life for all residents. 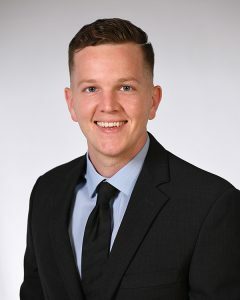 If you have any questions, please contact Jake Cooper, at (832)748-0343, or send him an e-mail at jake@thetgbgroup.com.